As the old saying goes, there's a right way and a wrong way to do every job. And that's especially true for installing Christmas lights. In fact, for every type of surface to which you wish to attach a light, there's probably one right way and lots of wrong ways to do it. Choosing that one 'right way' will pay lots of dividends. The installation job will go smoother. The installation will be more secure and durable. The installation will likely look better. And choosing the one 'right way' may even prevent permanent damage to the surface to which you’re attaching the lights. But choosing the 'right way' can be a bit problematical. That's because there are many different types of surfaces to which people commonly attach Christmas lights. And that means that there are lots of different 'right ways' for attaching those lights. Brick: Attaching lights to brick surfaces can be very tricky - but not if you're using brick clips. Brick clips are designed to facilitate the attachment of lights to brick surfaces without damaging the mortar between the bricks. Brick clips are available in multiple sizes. Clay Shingle Tiles: Clay shingles can be particularly challenging because they're smooth and slick. And they are also easily damaged. Clay shingle tile clips grip the tiles tightly enough to hold the lights in place, but without enough pressure to damage the tile surface. Ridges built into each clip helps to enhance gripping power without excessive pressure. C clips that can be installed with adhesive or hardware and left in place for multiple seasons (including adhesive clips designed for use only with mini lights). Magnetic clips that work great for surfaces that contain a magnetic metal. Gutters: Gutter hooks make the challenging task of attaching light lines to guttering a breeze. Roof Ridge Rows: Running strings of lights along rooftop peaks can make for a very dramatic look. 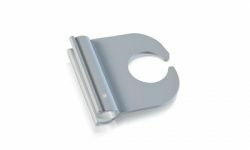 And ridge row clips are purpose-made for attaching lights to ridgelines. Trees and Shrubbery: Tree clips offer an easy, reliable means of attaching light lines to tree trunks and branches, and to bushes and shrubbery. Wood and Asphalt Shingles: There are a number of clips purpose-made for attaching lights to roofing shingles. The most commonly used is the plain shingle tab. The legs of the tab simply slip under the shingle. If you want more detailed guidance about the types of clips available for installing Christmas lighting, check out this guide. It contains a listing of all of the different types of clips that are available, along with how and where they're best used. You might want to consider printing it out so that you have it on hand as you order attachment hardware for this season. Then when Christmastime rolls around, and it's time to install your lights, you'll be prepared to do the job right - no matter the variety of surfaces you'll encounter. And having the knowledge necessary to do the job right is the one 'right way' to approach any job.